Founded near Frankfurt in 1863, the Hoechst dye works became one of Germany’s leading chemical companies during the country’s “second industrialization” in the last third of the nineteenth century. While the concentration of industry spurred an economic boom and led to new jobs and increased wages, it also caused the spread of pollution. 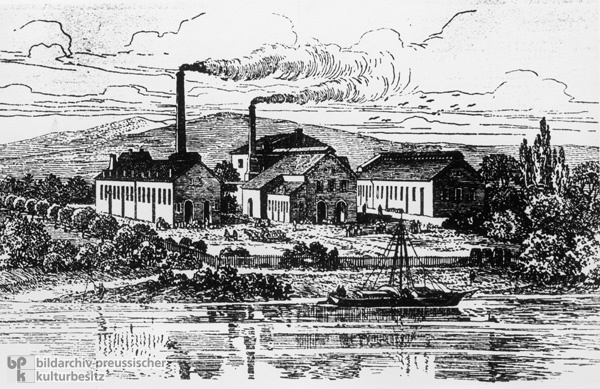 Chemical plants like Hoechst were mostly built on lakes and rivers, since their manufacturing processes required access to water. Thus, in addition to producing toxic emissions, they also piped waste water into lakes and rivers, damaging flora and fauna and fouling the essential supply of public drinking water. In the absence of environmental legislation, and with protests being limited to nearby residents, chemical plants had no incentive to alter their practices. Wood engraving by unknown artist, 1863.